Tiptoe along an abandoned viaduct 350ft from the ground, dive into the deep blue waters of a forest-edged lake, hike along a snowy ridge with deer hiding just beyond your path or sit for hours on a stony beach as the Northwest wind whips your hair and the sea-spray softens your skin. This is the Olympic Peninsula, and it is like nowhere you have ever been. I became obsessed with the Pacific Northwest a couple of years ago. Obviously it all sparked from social media... a mere scroll through my Instagram feed revealed what seemed to be hundreds of photographs capturing its beauty; sun streaming through forests, snow-capped mountains reflected in lakes or eerie beaches adorned with pine trees and pebbles. I had been wanting to see it for myself for a while, eventually making the trip as the beginnings of spring were transforming the region into a green oasis of flora and fauna; lakes gleamed as the sky remained cloudless and waterfalls gushed as snow continued to melt, then when the rain came I took shelter in the rainforests as drops hung off ferns and clung to mosses, and every shade of green glowed when the sun finally peaked between the clouds – an adventurer’s paradise. All photos shot on 35mm or iPhone, before the days of the DSLR. What I remember most about Seattle is wide, tree-covered streets, coffee shops, searching for nature, and being very hot. Oh, and the great REI store that I walked about an hour to find... Seattle is Washington's capital, and the start of my road-trip (before actually hitting the road) saw me spending three days wandering its streets. Since I was heading to the notoriously grey and rainy Pacific Northwest, I left most of my shorts and t-shirts behind in L.A. and travelled with a 90L duffel packed full of woolly jumpers and hiking socks. In Seattle it was about 30 degrees and I found myself constantly seeking the cool breeze of a park to sit and read a book in, or a coffee shop with an iced latte and air-con. I'd highly recommend Pike Place Market and the Public Library, both tourist hotspots and certainly worth a visit! Gas Works Park is big and beautiful on a warm day, and head up the Space Needle at sunset for a view of the city and Mt. Rainier in the distance. 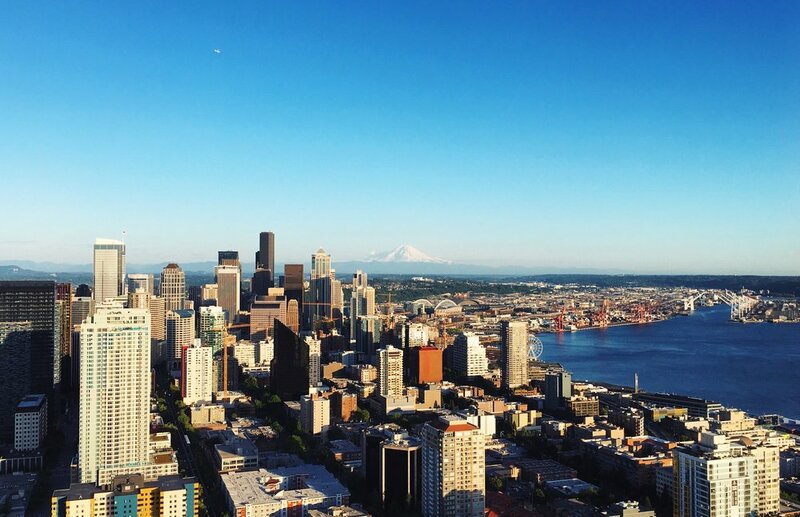 Take a ferry over to Bainbridge Island to spend an afternoon wandering in and out of the boutique stores and cafes, and marvel at the beautiful views of the harbour on your way home. As for coffee shops, you'll find an abundance of indie cafes on every street... A couple of my favourites were Milstead & Co. after an afternoon spent in Gas Works Park, and La Marzocco for its wide, open interior and even better coffee. After three days in the city, I was more than ready to leave. I picked up my white Prius, chucked my duffel on the back seat, and hit the road. Of course, I was nervous to be heading away from the safety of civilisation alone, but eager to see what was beyond the confines of the concrete jungle. My first stop was Mt. Rainier, that big old mountain that was forever visible from Seattle itself. I spent one and a half days at Mt. Rainier, staying out at Whitaker's Bunkhouse in between. The sky was blue and I was beyond thrilled to smell pine and be driving in and amongst the trees. Despite being named after a mountain, Mt. Rainier for me denotes more memories of forests. I hiked the Rampart Ridge Trail, a 5-mile hike from Longmire that ascends 1,400 steep feet - it's quite a slog, but views as you peer between trees are simply stunning. 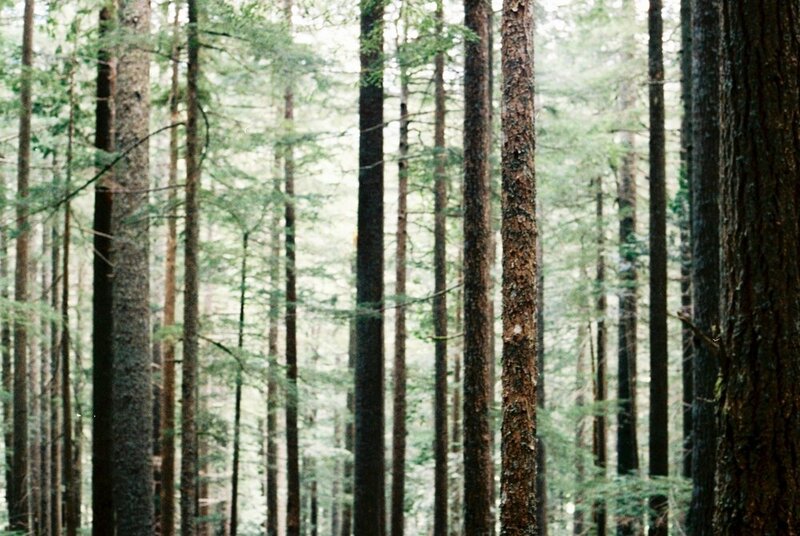 Thick forest of pine cones and needles consumes you until the sky breaks through, and views of Mt. Rainier from the clouds take your breath away. Before you read this you should know two things; a) it’s technically illegal to go here and b) I probably wouldn’t recommend a visit if you’re afraid of heights. Saying that I am both a) not much of a law-breaker and b) afraid of heights, but I also have an adventurous spirit… So I parked my car precariously beside ‘no trespassing’ notices and hiked the obstacle course-like trail to Vance Creek Bridge, since the logging company who own the land have placed logs and branches of all shapes and sizes across the path to ward away avid adventurers. 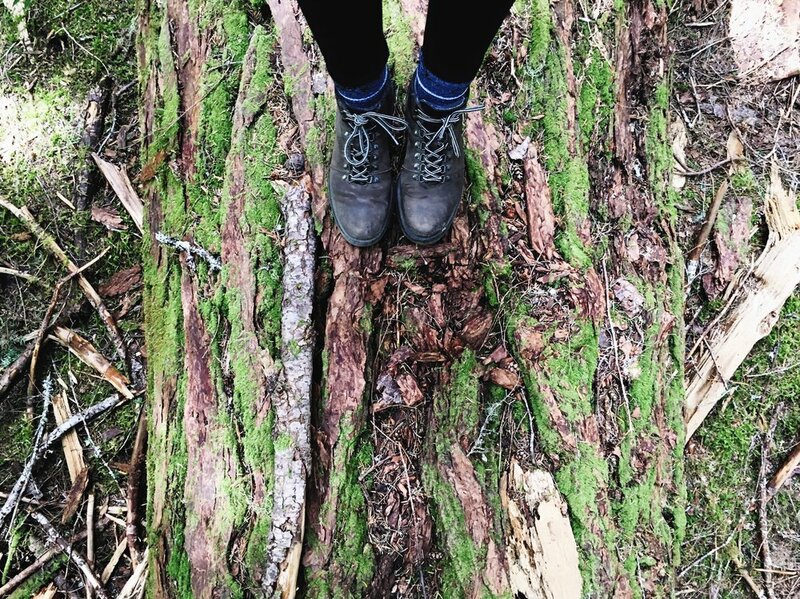 But what’s an adventure without getting your jeans dirty from sliding down bankings or climbing over tree trunks? Vance Creek Bridge was built in 1929 and abandoned in the 1950s, since remaining both unmaintained and off-limits. But it is first and foremost the beauty of this famous bridge that has drawn so many people to it. Standing 350ft from the ground, Vance Creek Bridge is quite literally in the middle of a forest; tall pines dominate the scene and far below a river runs through the valley. While people have been known to do handstands on the bridge, dangle their feet from the edge or even – rumour has it – hang from the metal bars that protrude out the sides, I only managed a bambi-like totter to around a quarter-way across. Enough to experience the epic views, to feel the breeze that perhaps one only feels in a forest clearing so high from the ground and to make it safely back to the other side before the jelly in my legs gave way. A place that reminds you of nature’s grandeur but also of the endeavours of man – that one day almost 100 years ago someone designed and built this incredible bridge, the second highest in North America. Disclaimer: I in no way wish to condone a visit to the Vance Creek Bridge, due to both the dangerous and illegal nature of the visit. I made my own decision to take the risk by visiting the bridge, and I only wish to inform readers of that trip. After an hour’s drive from Vance Creek Bridge I reach Lake Cushman, where I pull my car into a lay-by and clamour over a few boulders to reach a clearing, from which the lake’s grandeur can be appreciated in all its beauty. The sky is cloudless and vividly blue, the sun reflecting onto the deep lake creating diamonds on the water, edged by mountains and a dense pine forest that seems so full of mystery. But what strikes me first is the silence. I cannot see another human nor hear another vehicle. I am completely alone, my feet dangling towards the turquoise shores and my head tilted to the bright, warm sun. It is a moment of solitude and one in which nature grips me, and I let it take hold and breathe it in as long as I can. Lake Cushman is a mass of a lake, 16km squared on the north fork of the Skokomish River. There’s plenty to do at the lake; from boating to kayaking, bathing to BBQing, hiking to fishing. There are a number of private campgrounds and lodging options along highway 119 on the northern edge of the lake, or there is Staircase Campground which belongs to Olympic National Park and can be found at the northern tip, after driving along both paved and dirt roads from Hoodsport (the nearest town on highway 101) for 16 miles. There are also two popular (though enduring) hikes which take you to spectacular viewpoints: it is a steep, 3-mile hike to the summit of Mount Ellinor, at almost 6000ft or a slightly easier 6-mile round trip to Mount Rose, at 4000ft. Both trails are best tackled in early summertime, when the summits are clear of snow. After leaving Lake Cushman, drive north for two hours to Port Angeles where you may wish to grab a bite to eat, stock up on groceries and visit the National Park Visitor Centre for some advise and a few maps before entering Olympic National Park. From there, head towards Hurricane Ridge through pine forests and past sweeping vistas of the Olympic mountain range looming on the horizon. Carry on past the Hurricane Ridge Visitor Center to reach the trailhead. Deer feeding against a backdrop of thick forest and snow-peaked mountains, birds singing gleefully and wildflowers springing up on lush green meadows. Hurricane Ridge is an idyllic, natural paradise, one that Walt Disney couldn’t have created better himself. It is a short out-and-back hike along the ridge to a panoramic viewpoint at the top, though every turn over the three-mile hike along Hurricane Ridge reveals epic vistas and leaves you in breathless incredulity. Probably the most scenic hike over a short distance that I have ever completed, Mother Nature at her most beautiful and peaceful. Storm King, I later discovered, is a rather apt name given the difficulty of hiking this particular mountain. The hike kicks almost straight away, as steep switch-backs lead through a forest, up and up and up the mountain to a vertigo-inducing 4,534ft at the summit. But if, like me, you are always searching for the most challenging hike to the most epic viewpoint, Mt. Storm King is certainly one to try. As you climb out of the forest – higher than the tallest tree – views descend to Lake Crescent far below and the seemingly boundless forest surrounding you. The hike becomes so steep at the top that there are even ropes for added support. 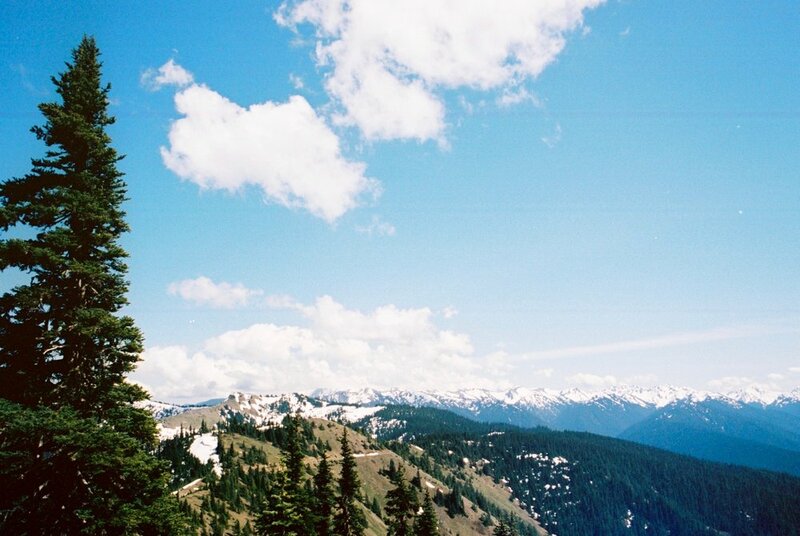 Over 1.5 miles, the hike takes you up 3,750ft to a 360-degree, eagle-eye’s views of Olympic National Park. Continue on Highway 101 from Lake Crescent before turning left down Sol Duc Hot Springs Road. Continue along the tree-laden road for around 14 miles before reaching the Sol Duc Falls carpark. It is a short, out-and-back stroll through Hoh Rainforest to reach Sol Duc Falls, taking you past pebbly streams, mossy branches and a large amount of a rather interesting shrub known as old man’s beard. After falling in love with the thick pines and snowy mountains I had already come across in the National Park, this was my first taste of the rainforest. There were plants I had never seen before and shades of green I never knew existed. The falls themselves are not renowned for being ‘the highest’, ‘the widest’ or ‘the strongest’ in the area, but because of the interesting way the waterfall is divided into four separate streams of gushing water. But then what I was discovering was that the Pacific North West didn’t seem to do things half-heartedly. It was almost as though nature was putting on a show for me to ‘ooh’ and ‘aah’ at every turn. Everything is as you have never seen it before in this little corner of the earth. I headed to the coast, wondering how I could top what I had already seen on the Olympic Peninsula; immense forests, bright blue lakes, snowy mountain ranges and gushing waterfalls. It was a hazy grey afternoon when I visited Rialto Beach, but somehow this seemed fitting with the eerie calm that comes with the entire coastline of the Pacific Northwest. Take away any notion of white sand and bright sun that you would usually connote with the word ‘beach’ and imagine instead soft, round pebbles beneath your feet and a semi-wild ocean lapping onto the shore. The sea-breeze is bitter, reddening your cheeks as eagles soar above, swooping in and out of the thick, pine forest that edges the beach. Wander north along the beach for about a mile and you’ll reach the ‘hole-in-the-wall’, an arch rock formation among a cluster of large, jagged rocks that huddle in the shallows of the ocean. 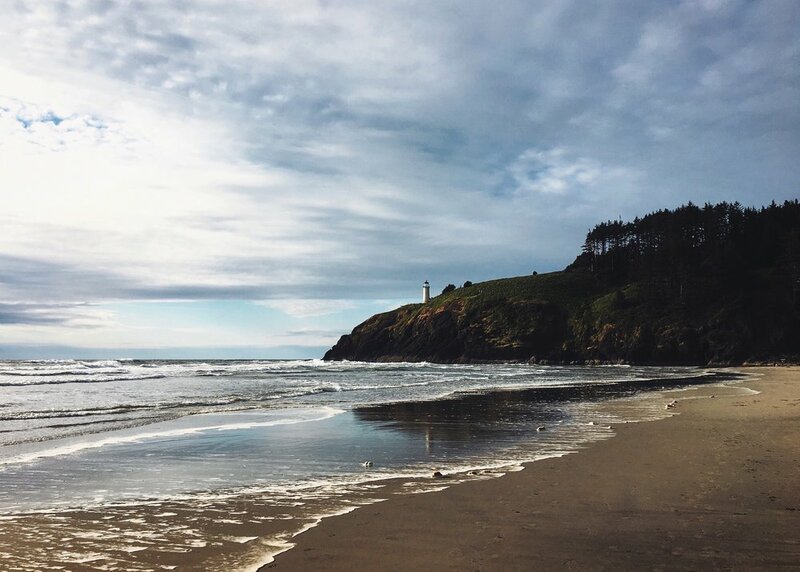 The sleepy, seaside town of La Push received a substantial influx of tourists around 8 years ago thanks to a rather famous Hollywood blockbuster named Twilight. 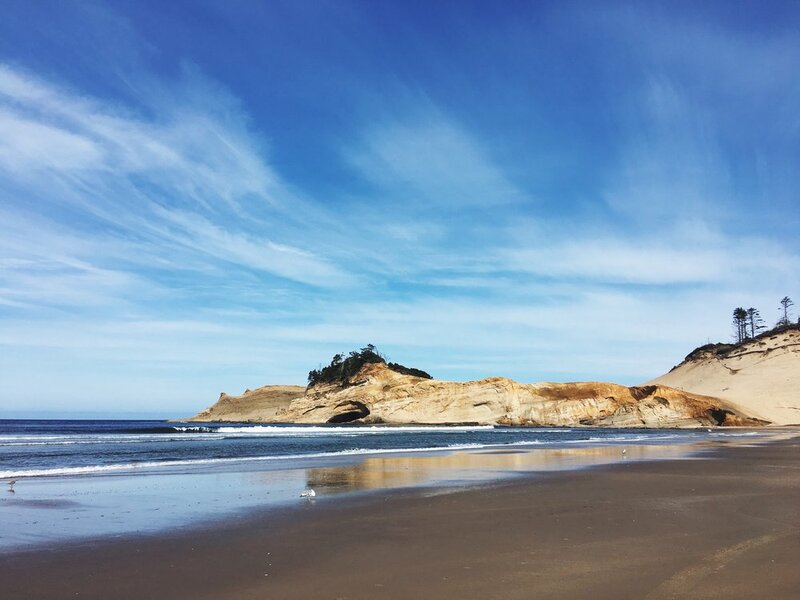 Now you’ll find an array of signs leading to “Edward’s Holiday Home” or “Jacob’s Cabin” along the road from Forks to La Push, but the town and its beaches themselves still retain their indigenous and natural charm. I walked the short path down to Second Beach in La Push at golden hour and waited for the sun to cast its soft, orange glow onto the ocean. Then twilight, and there was something quite mystical about this one. I later discovered that it is also possible to camp on Second Beach, something I’d have loved to do if I hadn’t already pitched my tent elsewhere. Darkness fell and the smell of smokey fires filled the air as people settled into their homes for the night. I’d go right back to Washington just to camp on that beach. Sun was setting and mist rising as I made my way into the Quinault Reservation, a fraction of the Olympic Peninsula belonging to the Quinault and Queets tribes. I recommend booking a site at Willaby Campground, shrouded by thick forest and sitting on the edge of Lake Quinault, it was one of the most scenic yet peaceful campsites I had stayed at. Wander along the shore from the campground to Lake Quinault Lodge, past boats sitting sleepily at their docks and canoes bobbing up and down in the shallows, ready for their morning journeys. Mist and clouds obscured what I imagine were hills in the distance, but there was something quite appealing about not knowing what mysteries lay beyond the clouds and beneath the lake. The lodge is an excellent place to grab a drink or use the wifi, or else cosy up on a deck-chair with a book or simply watch the gentle lapping of the lake onto the pebbly shores. It was my last night on the Olympic Peninsula, so I shut myself off to the world and soaked in every ounce of fresh-air I could before heading south, towards Oregon. Heading south along the coast, I stopped briefly at Canon Beach and spent a few hours at Insomnia Cafe before continuing to Cape Kiwanda, just as the sun appeared out of grey, rainy skies. I won't deny that I wasn't expecting much from Cape Kiwanda, but I loved rambling across the sand and up over the rocks, watching waves crash into the shoreline. It already felt much more tropical than Washington's misty beaches, yet not quite like California's palms and beach huts. Oregon was developing it's own unique landscape that I wanted to see more of. I detoured a long way to get here, despite never having heard of the park before coming to Oregon. Someone recommended Silver Falls State Park to me, and with a day to spare, I drove over there for the night on my way to Portland. If you like waterfalls, this park is definitely for you. Or rather, even if you think you don't like them, this park is still probably for you. Large, cascading bodies of water plunge into pools, surrounded by tall pines and mossy rocks. And each is so unique, in height, depth, surroundings and strength. I did the Trail of the Ten Falls which, needless to say, took in ten different waterfalls and was a brilliant way to see the park in a day. It's definitely worth spending a day on the Columbia River Gorge, taking in a few stops along the way. Visit Rowena Crest for that famous Instagram photo, while Hood River is a bustling little town filled with cafes and lunch spots to spend the day. 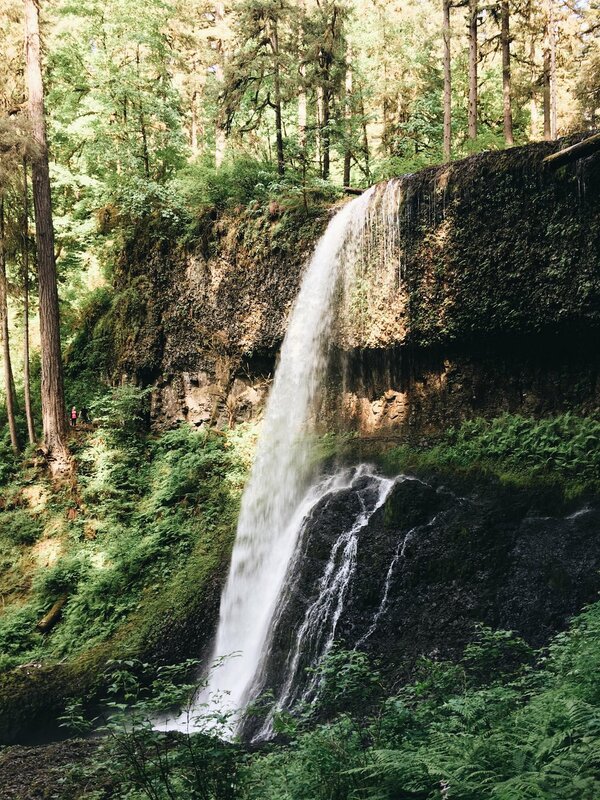 If you're not already tired of waterfalls, Horsetail Falls, Multnomah Falls and Bridal Veil Falls are all spectacular sights. This area is undeniably beautiful, but being so close to Portland it is a tourist hotspot so incredibly busy, especially at the waterfalls. Finding parking spots can be a challenge, as is escaping hoards of selfie-taking tourists. My journey ends in Portland, where I drop off my rental car and catch the bus into the city. I knew I'd love Portland before I even went there; the home of flannel shirts, Danner Boots, freelance friendly cafes, and the world's biggest book shop. I spent three days exploring the city, hopping between coffee shop to vintage shop to book shop. Head to Powell's bookshop to spend an hour or two browsing the shelves; the Botanical Gardens are a brilliant place to see nature in the city; visit the Alberta Art's District for an array of indie cafes and shops; and the Pearl District for classic Portland red brick and coffee shops galore. Portland houses some of my favourite outdoor brands; REI, Danner, Poler Stuff, Snow Peak and Pendleton all have stores in the city, so make sure you stock up on outdoor goodies before heading home. Summing up the Pacific Northwest requires much more than just one description. From forest to beaches, mossy trails to mountain-views; in three weeks days I felt I had seen more diversity of nature than some city-dwellers have the fortune of seeing in a lifetime. I can’t remember what I ate yesterday for dinner, or the name of the film I saw last week, but I remember the snow-peaked mountains, the colour of the ferns in the rainforest, the eyes of the deer I came within inches of. I remember the shape of the pebbles on the beach and the feeling of the wind on my cheeks as I sat staring at the sea. Now all I can do is urge you to go there, for it is perhaps the most breath-taking place I have ever been.